Did you all see the crazy art news last week? A new Vincent van Gogh painting was discovered–120 years after the artist’s death. One of my majors in college was Art History and I definitely spent a whole day exploring the museum in Amsterdam. I’m totally geek-ing out. 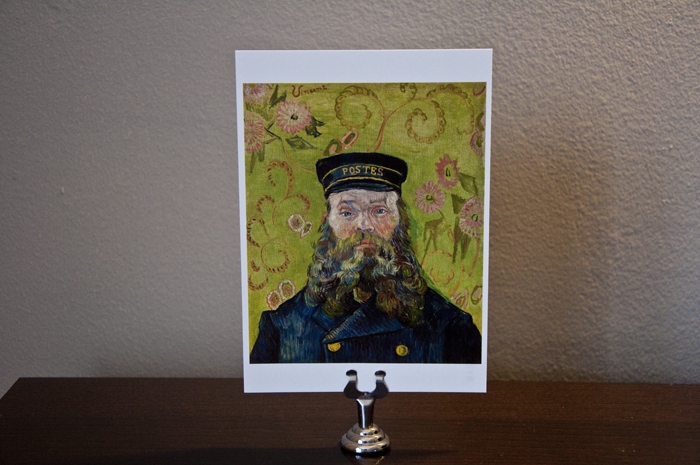 Because I’m a mail lover, I can’t help but be charmed by van Gogh’s paintings of his friend, Joseph Roulin. Joseph was a postal employee in Arles, in the South of France and he played a big role in van Gogh’s life. After the artist’s psychotic episode (which resulted in him slicing off a part of his own ear) Roulin tended to him and corresponded with his family, while he was in asylum. They shared a dear friendship–some even called Roulin a “big brother” to the painter. Six different portraits were made over an eight-month period in 1888 and 1889. I love them all. One of his paintings of Roulin hangs in The Museum of Modern Art in New York City. I love being able to visit it whenever I’d like. The postcard above is from The Barnes Foundation in Philadelphia. Do you have a favorite van Gogh painting?